Jeff Salmon, General Manager of Denwill/Bridgeway-Ironclad Logistics, runs a fleet of 10 trucks that have travelled aprox. 310,000 miles with 475 horsepower engines on first generation HPDI. Hauling a gross vehicle weight of 63,500 Kgs. of gas and diesel in British Columbia’s Lower Mainland and up the Trans-Canada Highway with stops in Pemberton and the Greater Vancouver area on the way to Hope is a regular day in the life of one of Denwill’s trucks, powered with a Westport 15L featuring first generation high pressure direct injection (HPDI). Jeff Salmon, General Manager of Denwill/Bridgeway – Ironclad Logistics, based out of Burnaby, British Columbia, has a fleet of 10 Peterbilt Model 367 trucks hauling tanker trailers that transport petroleum products to more than 120 fuel stations and card lock locations across the Lower Mainland region. 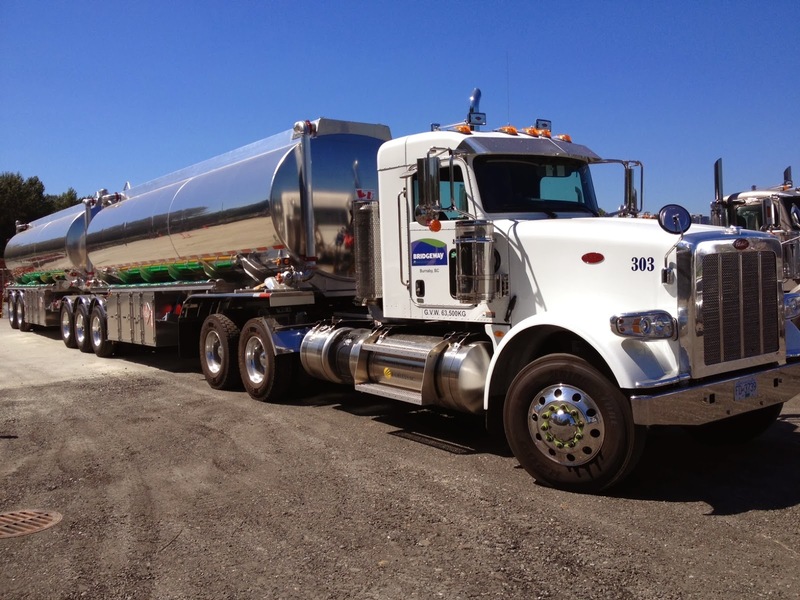 The natural gas that powers the engine is stored as liquefied natural gas (LNG) on each truck. “We’re in the petroleum industry and we want to be involved in the transportation of liquid natural gas – we want to be a significant hauler in the LNG industry– and we feel we are contributing to an overall greener environment by using LNG-powered engines,” Jeff said. Denwill/Bridgeway purchased the LNG powered Peterbilt fleet in July 2013 and have ordered an additional seven trucks with the Westport 15L engine. “We think that it’s going to be a growing aspect of the trucking industry over time and we felt that we wanted to be at the forefront of the industry,” Jeff said. Since July, the trucks have travelled approximately 310,000 miles (500,000 kms) with the 475 horsepower engines. Jeff said he is following a regular service program; his trucks are being serviced by his local Peterbilt dealer. "We wanted to be at the forefront of the industry," Jeff said.